Willow, under the direction of Pamela Fincham, is one of the premier interior design firms in Florida. Pamela, a licensed interior designer, has completed projects of private residences and vacation homes from Jupiter Island to Athens, Greece. These design projects included a full range of interior design services, the scope of which was not limited to just fabric, furniture and accessorizing but encompassed new construction, remodeling, custom kitchen/baths, cabinets, millwork, electrical, design consultations, project manager and space planning for one room or the entire project. Pamela’s style of casually elegant refinement expressed in comfortable and inviting interiors has received numerous awards, including the coveted Cover and featured article in Florida Design, a 7 time winner of Palm Beach Illustrated’s “Dream House”, Who’s Who in Interior Design, Who’s Who in Executives and Professionals and she was featured twice in the hard cover coffee table book, The Best of Florida Design. Pamela’s award winning design has been present in regional and national design publications, including Florida Design, Architectural Digest, Palm Beach Illustrated, Veranda, Vive, The Best of Florida Design Vol. 1 & Vol.2, Southern Living, Town and Country, Palm Beach Home and Decor, Miami Home and Décor, Elle Décor, Boca, Treasure Coast, Palm Beach Cottages and Gardens, Style and Insight. 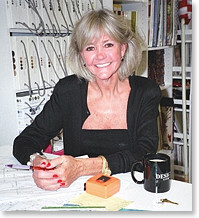 As a columnist/author of “Design Lines”, Pamela’s exceptional taste and design logic has been an ongoing feature in many of the area’s publications. Since Willow’s doors opened in 1991 Pamela’s design artistry has acclaimed her as one of the profession’s, brightest, busiest and most talented design leaders.